Over four millennia ago, the fortress town of Gonur-Tepe might have been a rare advanced civilization before it was buried for centuries under the dust of the Kara Kum desert in remote western Turkmenistan. After being uncovered by Soviet archeologists in the last century, Gonur-Tepe, once home to thousands of people and the center of a thriving region, is gradually revealing its mysteries with new artifacts being uncovered on every summer dig. The scale of the huge complex which spans some 30 hectares can only be properly appreciated from the air, from where the former buildings look like a maze in the desert surrounded by vast walls. Just 50 kilometers (30 miles) from the celebrated ancient city of Merv outside the modern city of Mary, the ruins of Gonur-Tepe are an indication of the archeological riches of Turkmenistan, one of the most isolated countries in the world. Around 2,000 BC, Gonur-Tepe was the main settlement of the Margush or Margiana region that was home to one of the most sophisticated, but little-known Bronze Age civilizations. The site — which until the last century was covered by desert and scrub — was uncovered in Soviet times by the celebrated archeologist Viktor Sarianidi who, at the age of 84, is about to spend another summer working on the site. “I remember so well my joy when I first encountered this archeological Klondike. A sensation right under your feet,” the Russian professor told AFP. Every digging season at Gonur-Tepe yields new discoveries showing the quality of the craftsmanship of the Bronze Age artisans in the town which at the time would likely have been home to thousands of residents. The town’s craftsmen could mould metal, make silver and gold trinkets, create materials for cult worship and carve bone and stone. “It’s amazing to what extent the people possessed advanced techniques. The craftsmen learned how to change the form of natural stone at a high temperature and then glazed it so that it was preserved,” said archeologist Nadezhda Dubova. “This year, Gonur has given us another surprise, a fantastic mosaic,” she said, noting that such an object pre-dated the standard era of mosaic-making in Greek and Roman antiquity. 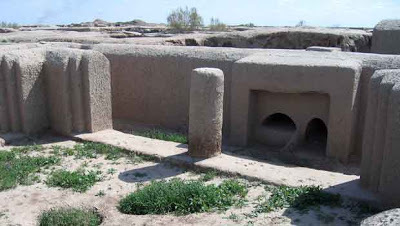 The ruins of Gonur-Tepe are the centerpiece of a network of towns and settlements in the delta region of the river Morghab that flows through Turkmenistan from its source in Afghanistan. Gonur-Tepe is a three-hour drive from the provincial center of Mary — two hours along a bumpy asphalt road that passes former collective farms that have now fallen into disuse, and then another hour-long slog through the desert scrub. Mary, 380 kilometers from the capital Ashgabat, is a typical Turkmen provincial city, home to 200,000 people and largely built in the Soviet style with a railway connection and low-rise apartment buildings. Some 30 kilometers (19 miles) outside Mary lies the other great glory of the region — the great ruined city of Merv, whose importance goes back to the time of the Achaemenid Persians and reached a peak under Turkic rule in the 12th century AD. Merv went into terminal decline after it was sacked by the Mongols in 1221 in a deadly conquest that left tens of thousands dead. 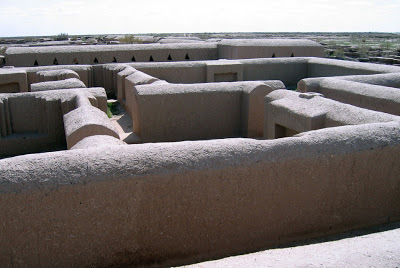 Its ruins are as deserted as those of Gonur-Tepe. Its greatest treasure is the still preserved mausoleum of the Seljuk Sultan Sanjar under whose rule Merv was a city of 200,000 people and briefly one of the most heavily populated settlements in the world. The mausoleum, which is crowned by a cupola with a diameter of over 17 metres, was revolutionary in its design, Turkmen architectural historian Ruslan Muradov told AFP. The design of the dome “anticipates by 300 years the ideas of the great Renaissance architect Filippo Brunelleschi” who designed the great dome of the cathedral in Florence, he said. Unlike the ruins of Gonur-Tepe, ancient Merv was excavated as far back as Tsarist times when today’s Turkmenistan was a far-flung outpost of the Russian Empire. It has been listed as a World Heritage Site by UNESCO since 1999. Archeologists have only just begun to scratch the surface of the huge riches of the Mary region, said Viktor Turik, a historian who works at the Mary history museum. “In the region there are 354 archeological monuments, 95 percent of which have, until now, not been studied by experts,” he said. Turkmenistan remains one of the most isolated countries in the world but still sees a trickle of foreign tourists every year, mostly on organized special interest tours. Mary has just three hotels although President Gurbanguly Berdymukhamedov has recently ordered the construction of a new 350-bed hotel in an apparent bid to boost tourism. Meanwhile the question remains about what to do with the extraordinary silver and gold artefacts that are being unearthed in the region but which need painstaking restoration and conservation. An employee of Turkmenistan’s national heritage department said a joint project had been mooted with the antiquities department of the Louvre in Paris, but had fallen through.